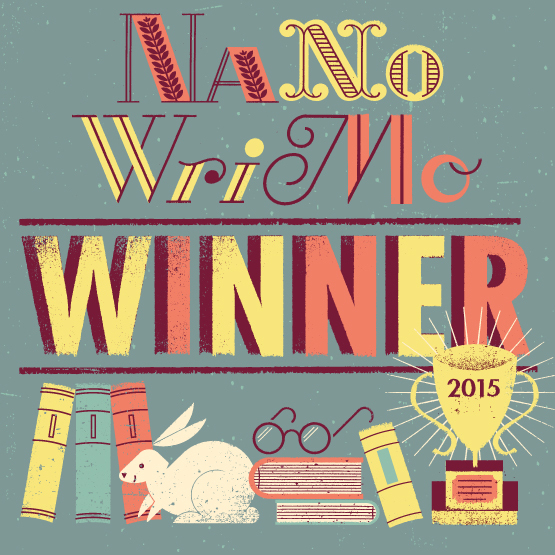 It happened! 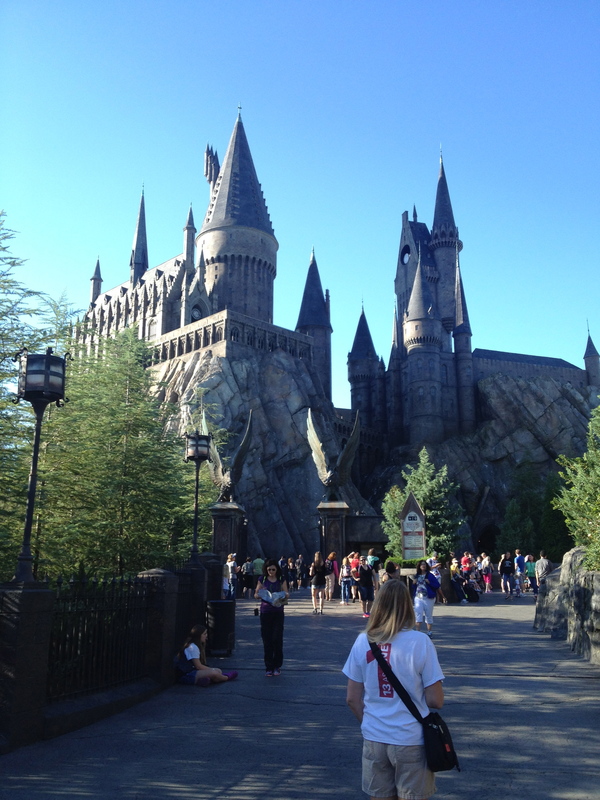 I got to go to Harry Potter World at Universal Studios in Florida last week! Yeek!! It was awesome, no doubt about it, and there just wasn’t enough time to see every little thing. I fully intend to go back again someday in the future. Just look at that castle! A perfect recreation of Hogwarts from the movies, and it’s so interactive while you’re waiting in line. 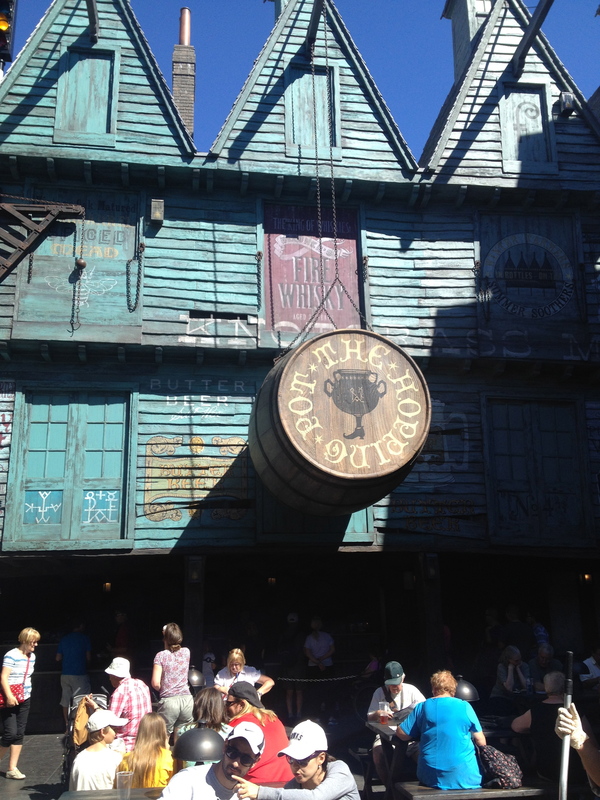 If you don’t want spoilers for the theme park, stop reading here and just enjoy the pictures instead. 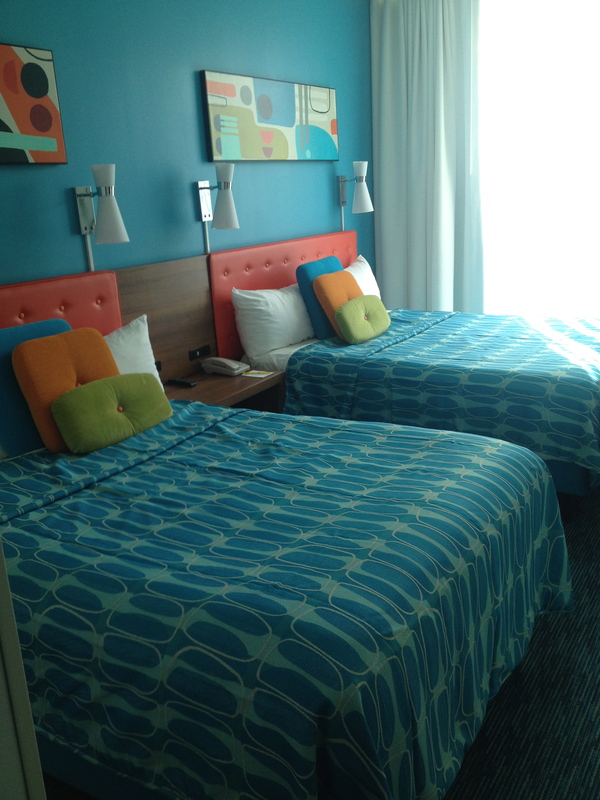 First, when my friend and I checked into our hotel, I was delighted to see it was designed to be completely 1960s. Look at the room! Neat, huh? I thought so. I thought the colors and artwork and decor was fabulous. And our view wasn’t too bad, either! That’s a lazy river pool down there, and if you look closely across the pool, you can see another wing of the hotel and a little of what it looked like from the outside. I didn’t take a picture of it, but you could also see the top of Hogwarts from just outside the door of my hotel. I didn’t take nearly as many pictures as I’d intended because I just wanted to soak it all in. Since my friend and I stayed at a Universal hotel (for much less than you’d expect), we got into the park an hour early. 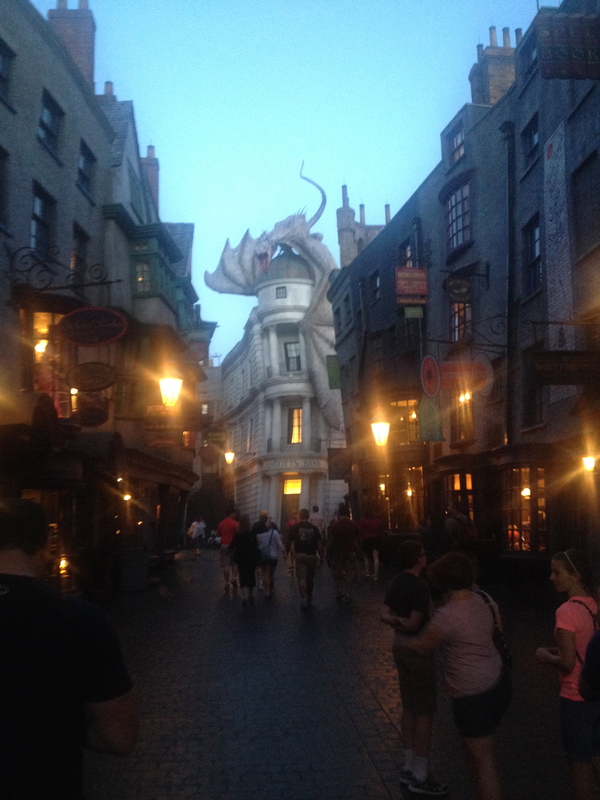 We were walking through Diagon Alley at 7:00 in the morning! Yikes! But totally worth it. 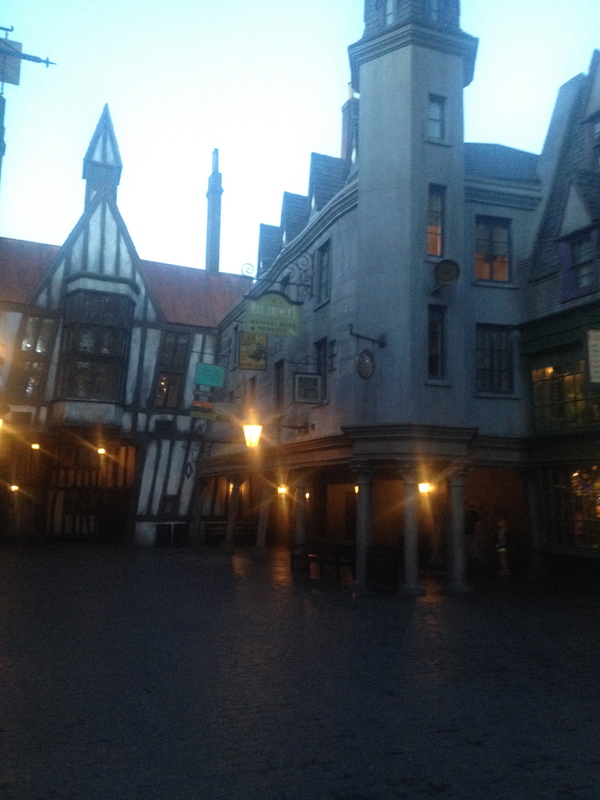 Here’s the first shot of Diagon Alley in the early morning hours. I wasn’t expecting the dragon on top, but it was pretty cool, and you’ll see why in a minute. 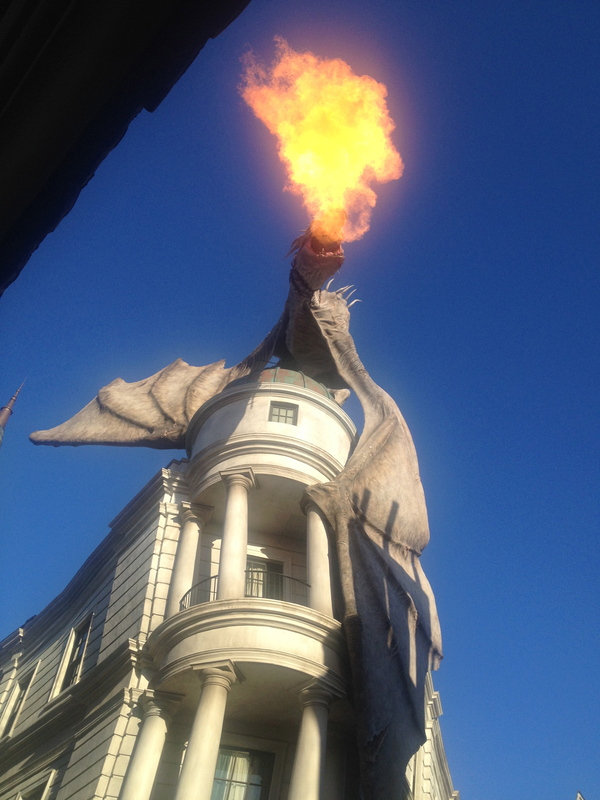 We immediately raced to Gringotts because that was the newest ride. We stood in line for about an hour, only to have it announced that something was wrong with the ride. BOO!!! However, they gave us one-time-only fast-passes to use later that day, so we came back a few hours later and got to skip the line. BEST RIDE EVER! Seriously, it was my favorite ride of the day. So interactive and a ton of fun. 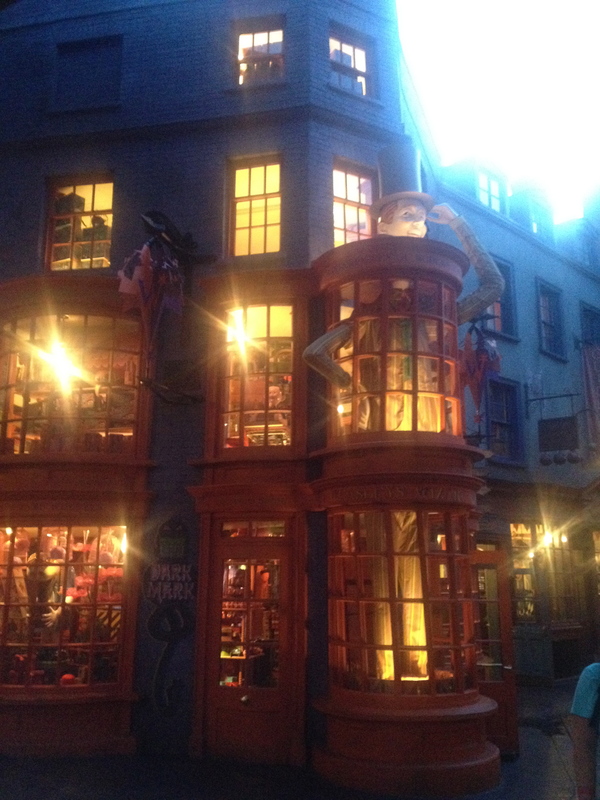 Here’s some more Diagon Alley. 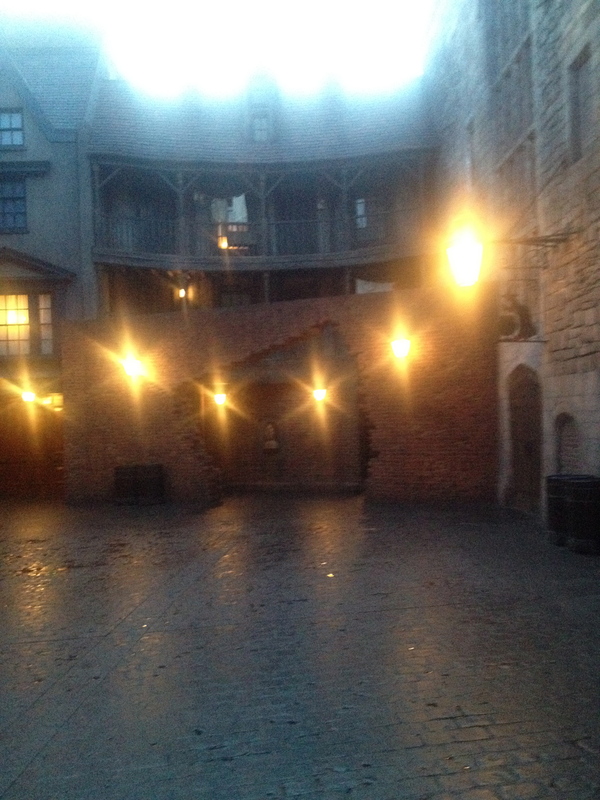 The hole in the brick wall behind The Leaky Cauldron. 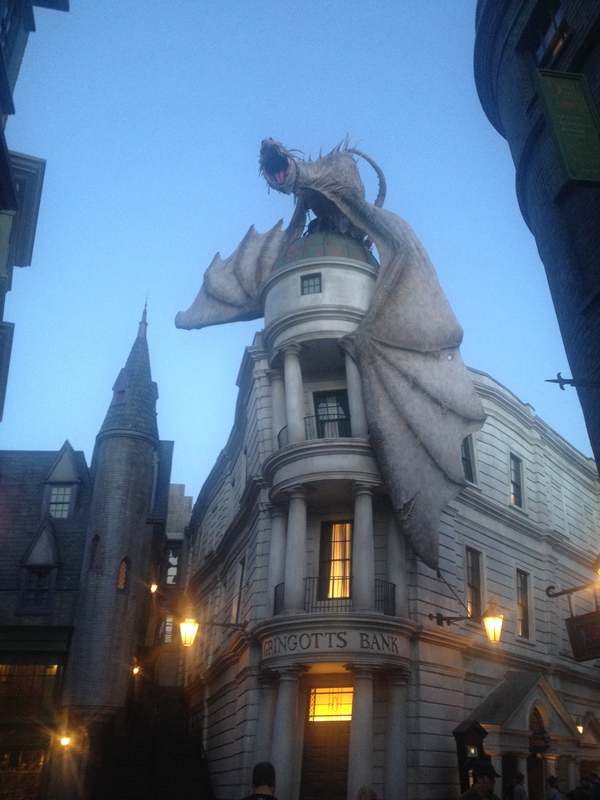 Just another cool Diagon Alley pic. We also went to Knockturn Alley, but it was too dark (as it should be) to take pictures. The dragon breathes smoke!! Sweet! Many of the shops were similar in appearance, so I didn’t snap pics of them all. 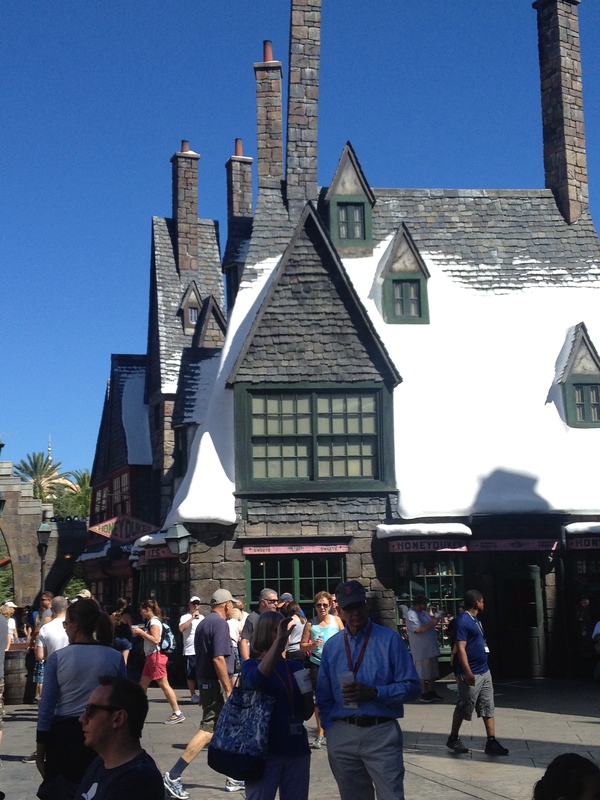 Once we were done looking around there, we headed to Hogsmeade via the Hogwarts Express. 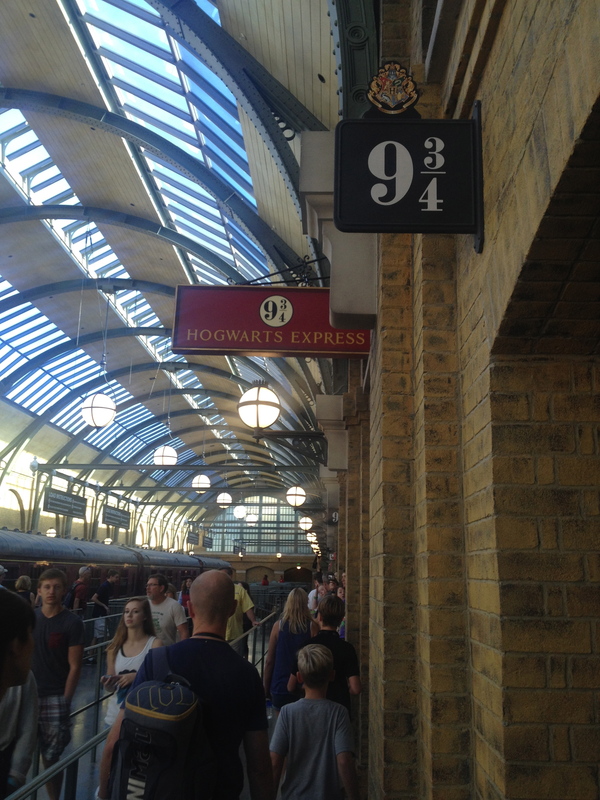 At platform 9 3/4. Every single thing there is interactive, including when you wait in line and are on the train. So much to see and do, that you’re not really bored waiting for so long. 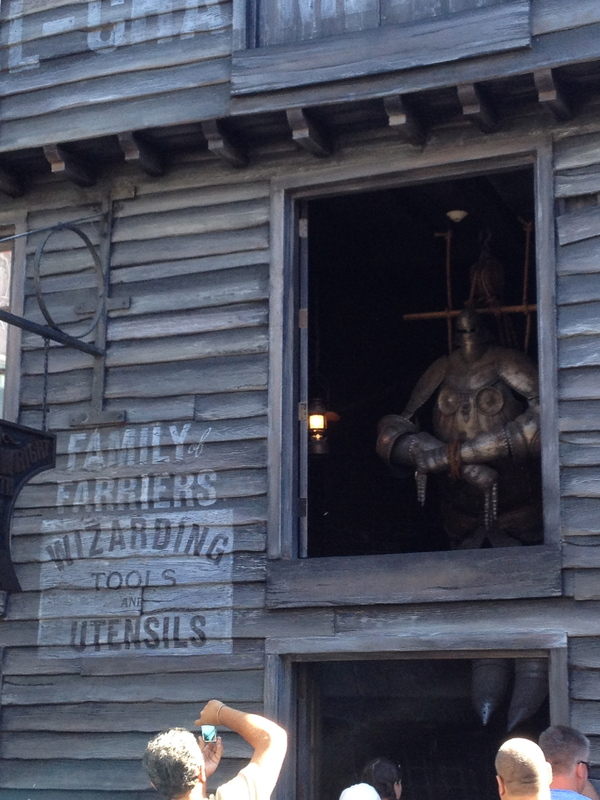 There are LOTS of animatronic robots of all sorts of HP characters, as well as visuals and interactive images of Harry, Ron, and Hermione. And there she is! 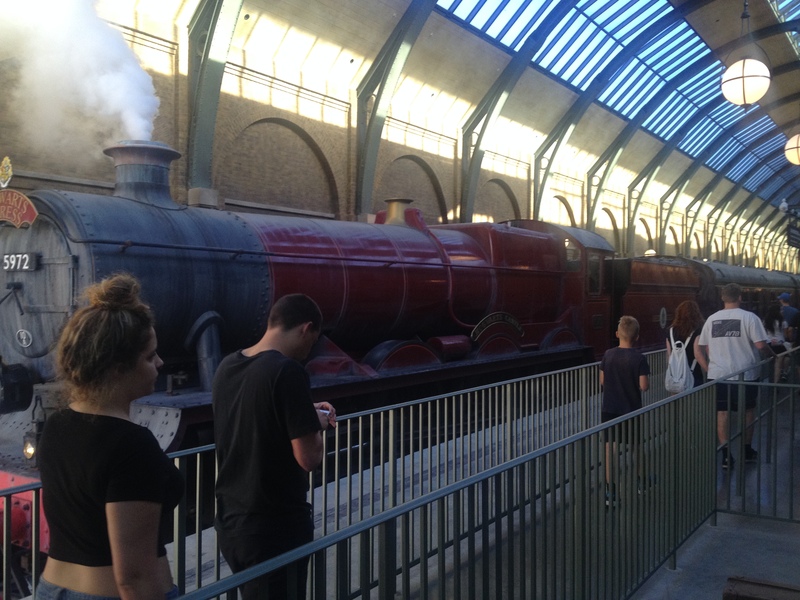 The Hogwarts Express! Before you ask… YES. I did get a butterbeer. And it was delicious! Beyond tasty. Yum!! And here’s Honeydukes. I didn’t buy anything there because I was so full after lunch. But it was awesome seeing all the things in the books and movies for sale right in front of me. This ride was fun, but man, did it make me feel queasy. And I have a super solid stomach on rides, but this made me feel a bit sick afterwards. It was a ton of fun, though. All of the rides were. I can honestly say there wasn’t one thing I saw or experienced that didn’t 100% live up to my expectations. After a morning/early afternoon of rides and such, my friend and I shopped for a bit. I could have done some SERIOUS damage there, but I didn’t check any luggage on the airplane, so anything I bought had to fit into my carry-on. Sorry for the poor quality. I know it’s far away and dark. You can look it up online once you find out which one it is. Can any of you guess whose this is? Hmm??? No. It’s not Ron’s. Or Dumbledore’s. Or Voldemort’s. Or Ginny’s. Or Sirius’s. All right. I’ll tell you. Ha! They were all so into their roles. Loved it. Mad-Eye is one of my very favorite characters. 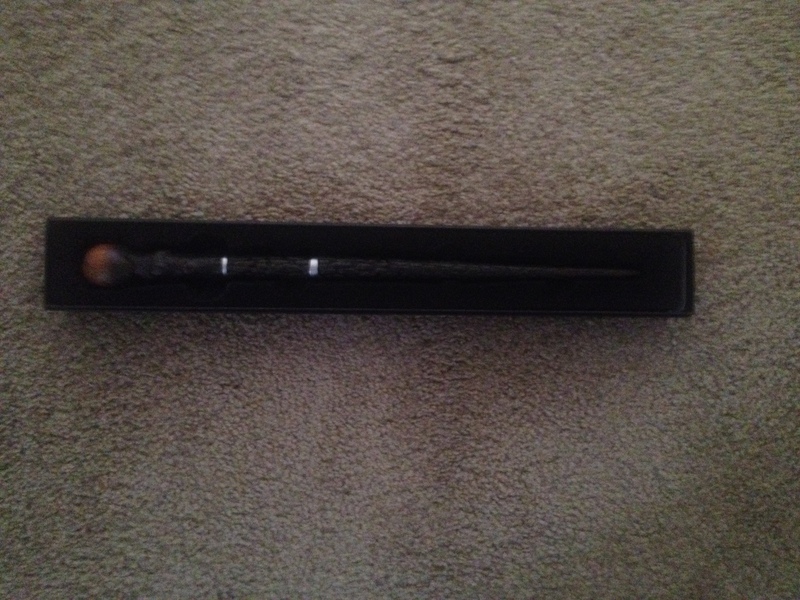 I was bummed they didn’t sell Hagrid’s pink umbrella wand, because if they had, that’d be the one I’d have bought. So, there you have it. 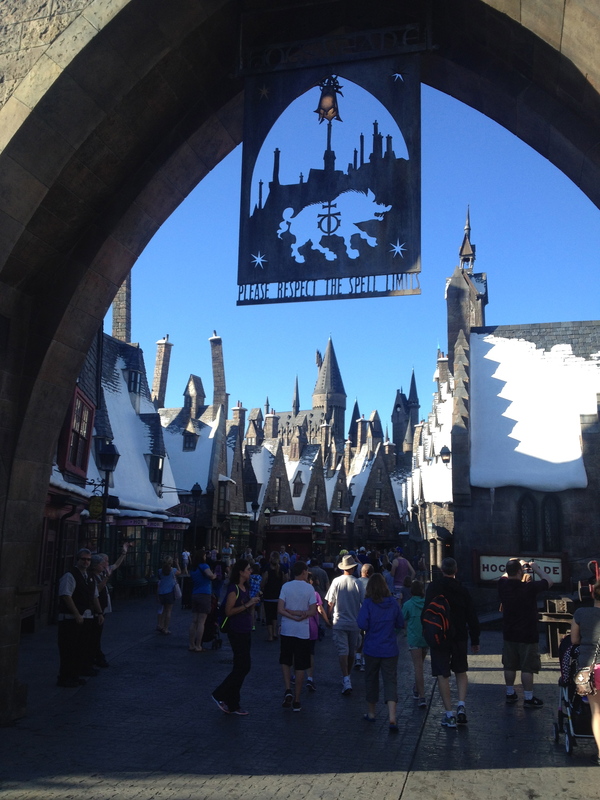 A wonderful trip to HP World. It was a fabulous day and an experience I’ll never forget.